UCLA’s Smart and Sustainable Cities Conference will provide a forum for the exchange of knowledge and experience between the US – especially California – and Israel, which share many of the same environmental challenges. With a focus on “what’s new,” leading academics and practitioners from both countries will present the most innovative models for urban sustainability. They will address the policy, design and technology experiments being implemented today; consider what holds the most promise; and propose future directions for city management and development to move us toward a more sustainable future. Panel sessions will cover the key areas of energy, water, transportation, the built environment (sustainable architecture, affordable housing and public spaces), and the digital city & sharing economy, exploring the evolving values and lifestyles made possible by digital communications. 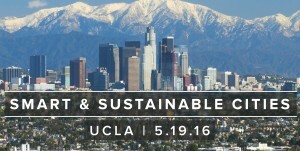 Presenters: Los Angeles Mayor Eric Garcetti will give the keynote address and discuss LA’s Sustainable Cities pLAn.